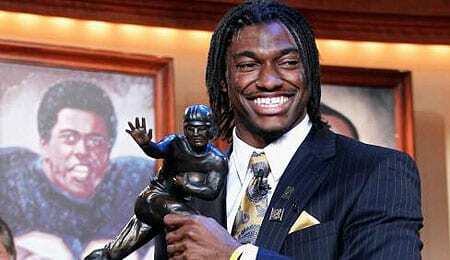 Heisman Trophy winner Robert Griffin III should be a beast as a rookie. The NFL draft is looming, a proverbial Christmas in April, where football fans get a little taste of the action without a snap being taken. In many ways it is just as interesting as the games themselves, and the storylines and headlines are always aplenty. While the average Fantasy football owner may not be locked in yet, dynasty Fantasy footballers know the importance of building their own draft boards. For anyone not familiar, dynasty leagues allow you maintain a roster where you keep your players from year to year. Some leagues have salary caps, some have contract lengths, but most all of them incorporate a rookie draft each year. There are many ways to set up dynasty leagues, so if you enjoy Fantasy football but haven’t tried a dynasty league, look around for one as they are tons of fun and very rewarding if you build an unstoppable franchise. If you play for keeps, you need to start doing your homework on the incoming class so you know how to fill in the holes in your roster and prepare for the future. Keep in mind these rankings are not just for the 2012 season, but a projection of long-term value. For instance, Robert Griffin III may have a better rookie year than Andrew Luck due to team strength, but it does not mean he will project out as the better long-term Fantasy player. The Fantasy football that most of us grew up on was predicated on gathering the best group of running backs you could find and then surrounding them with a few good wide outs. Quarterback was almost an afterthought for a lot of players, because hey, there is not that much of a difference who you get, save for the elite few. Well, not so fast. Today’s NFL is a quarterback’s league and if you are in a dynasty league, most of the powerhouses are built with that stud quarterback as a backbone. In many years, it does not seem right to target a QB early in your dynasty drafty, but this year is way different. Sorry, Trent Richardson and Justin Blackmon, not buying the elite hype on you – this is a two-horse race. Obviously if your dynasty team is stocked with Pro Bowl quarterbacks, you may want to trade down or just go ahead and take Richardson, but otherwise consider taking one of the two elite signal callers who should both start immediately. Here are the pre-draft top 20. After the draft, we will update the rankings, expanding it to the top 36 (standard 12-team league with three rounds). We will even add the top 15 IDP (individual defensive player) prospects for those you in dynasty leagues that play with players on both sides of the ball. This is a deep draft, so you’ve got to know your players when you are on the clock. 1. Andrew Luck, QB, Stanford: With all of the RG3 hype and Trent Richardson talk, it seems like everyone is almost overlooking the prized jewel of the draft class: Andrew Luck. He is that can’t-miss once-in-every-20-year prospect. If QB is a position of need on your dynasty team, don’t outsmart yourself, take Luck. 2. Robert Griffin III, QB, Baylor: RG3 is quite an intriguing prospect with a skill set that nobody this highly touted has ever possessed. He is not Cam Newton, he is faster. He is not a running quarterback, he is a pocket passer with sprinter speed. Griffin will be the starter in DC (assuming the Colts don’t grab him) from Week One and may even have more early success than Luck because the Redskins have a stronger team built around their incoming franchise QB. 3. Trent Richardson, RB, Alabama: This valuation totally depends on which backfield Richardson lines up in this year. In order to hold this position, he needs to land in a situation where he is a 20-carry guy out of the gate. If he is drafted by Tampa Bay, I think LeGarrette Blount cuts into his carries, especially if Blount works on his ball security and impresses new head coach Greg Schiano. The best scenario for Richardson is if he winds up on the Browns, but I would never trust Mike Holmgren to take a skill guy early. 4. Doug Martin, RB, Boise State: Put Matt Forte, Maurice Jones-Drew, and Ray Rice in a blender and you very well might make a Doug-Martin shake. While he is not as good as the sum of the three, he has certain characteristics (good and bad) of each. He is short and does not have game breaking speed, but he is a very powerful runner, an above average blocker, and has good hands. Martin is one of the guys who could drop dramatically in the rankings if he is drafted by a team with an established running back. In my eyes, the Boise State product is clearly the second best three down back in the class. 5. Michael Floyd, WR, Notre Dame: Slowly sneaking up on Justin Blackmon as the top WR rank in the draft, Floyd has the best long-term outlook of any receiver in the draft. Floyd is tall (6’3”), has great hands, runs precise routes, accelerates out of breaks and just gets open. He doesn’t have that extra gear of speed (only one catch longer than 35 yards last year), but is fast enough to get separation and be productive within 20 yards of the line of scrimmage. I could easily see Floyd going eighth overall to Jacksonville, where he would be the clear No. 1 WR and get tons of targets (although Blaine Gabbert may be the one throwing), but he should not get past Arizona at pick 13. 6. Justin Blackmon, WR, Oklahoma State: We’re going off the board a bit by having Blackmon below Martin and Floyd, but we’re not sure Blackmon turns out to be anything more than a glorified possession receiver. He dominated fools in college, but have you seen the swiss cheese secondary play in the Big 12? Blackmon will contribute, but we are thinking he’ll have more of a Dez Bryant trajectory than Julio Jones or A.J. Green. 7. Lamar Miller, RB, Miami: The former Hurricane has game-breaking moves and elite speed, but he often came off the field on third downs and at the goal line, which is a red flag for Fantasy purposes. Lack of touchdowns and receptions out of the backfield will seriously diminish Miller’s statistical output. If he improves in protection and shows he is a capable receiver, his stock could improve over the first couple years of his career. Miller’s a nice prospect for your team, but don’t draft him to fill an immediate need for this season. 8. Kendall Wright, WR, Baylor: RG3’s main man from Baylor shows up more on the field than in the combine. Wright redeemed himself by running a 4.44 40-yard dash on his pro day after a disappointing 4.61 at the combine. He has the ability to adjust to throw and use his elite after-the-catch skills to make big plays. Of course, since the NFL draft has turned into a dog and pony show, Wright will be slightly overlooked because he measured in at under 5’11”, has small hands, and short arms. We are very interested to see where he lands because he could be very productive if he winds up in a favourable situation. 9. David Wilson, RB, Virginia Tech: Wilson is potentially an every-down back and is strong in short yardage, but he fumbled seven times in 2011. Also, chances are he lands in a RBBC (running back by committee) where his value will be unclear until a few weeks into the season. But if Wilson winds up somewhere like Atlanta, he may have a starting gig by 2013 (bye bye, Michael Turner). 10. Stephen Hill, WR, Georgia Tech: Hill is an intriguing prospect because he came from a running offense in college so he never put up huge numbers. He should be an above average blocker and his measurable (4.36 40-yard dash, elite jumping skills, etc.) are what you want out of your big play wide out. Georgia Tech has had good success churning out pro WRs, producing Calvin Johnson and Demaryius Thomas in the last few years. We think somebody will fall in love with Hill and take him higher than we’re expecting. Fantasy drafts may be no different. 11. Coby Fleener, TE, Stanford: We are higher than most on Fleener, but we love what he brings to the table as a pass catching tight end –- which is what we care about in Fantasy. An ideal situation would see him drafted in the second round by Indianapolis, where he can be paired with his Cardinal QB Luck. You want a stud TE in your dynasty league as the position is producing more points than ever. We like TE Dwayne Allen out of Clemson, but are not sure he has the same long-term potential of Fleener. 12. Rueben Randle, WR, LSU: Randle reminds us a little bit of Hakeem Nicks, which is all you need to hear to get excited. Randle has great hands and size (6’4”), but needs to work on route precision. We will be very interested to see where he lands, hopefully somewhere where he will receive plenty of targets. 13. Ryan Tannehill, QB, Texas A&M: Do not draft Tannehill with the intentions of playing him this season or even next, but he is a solid stash selection as he could develop into something special. At this point, he is a wild card as he hasn’t even played 20 games at QB in college. Tannehill is a converted WR with good athleticism and by all means has the make-up to be an NFL signal caller. 14. Chris Polk, RB, Washington: Polk is a very tricky prospect to grade at this point because he had a good season, but didn’t perform in the Senior Bowl and didn’t stand out at the combine. From what we can see, he seems like a gamer that fits an NFL-style rushing attack more so than a college stand-out like LaMichael James. 15. Mohammed Sanu, WR, Rutgers: By no means will you confuse Sanu with DeSean Jackson. Sanu is quick but not fast and has good size at 6’2”, 211 pounds. He was extremely productive last season, hauling in 115 catches for 1,206 yards for a sub-par Rutgers squad. We think Sanu can fill a role in the NFL and have a productive career, but we never see him emerging as a top 25 wide receiver. 16. Alshon Jeffery, WR, South Carolina: Jeffrey is a tall (6’4″) wide out with potential, but his value depends on opportunity and how quickly he adjusts to the NFL. He has proven on film that he is productive, even when fighting off SEC-quality double teams. 17. LaMichael James, RB, Oregon: James is very quick and fast, but he played in a gimmicky offense that didn’t give a good indication of what his role will be in the NFL. He will have a lot of question marks, but there is no denying that he could be a game breaker if used correctly. James is one to watch and grab if he slips late in your draft. 19. Bernard Pierce, RB, Temple: Pierce is a workhorse type back who is good at gaining the tough yards between the tackles. He will make a nice complimentary back most likely but his Fantasy value will come down to opportunity. 20. Ryan Broyles, WR, Oklahoma: Broyles’ draft stock slipped when he torn his ACL five months ago. He has been pushing his rehab in order to improve his draft prospects. Broyles has the skills and determination to be a very polished slot receiver and should be especially valuable in PPR leagues. Because of the injury he will be overlooked in the draft, but we think he will have great value if you take him around the 20th pick in your rookie draft. After steadily increasing their win total over the past three seasons (2009 — 59; 2010 – 69; 2011 — 80), the 2012 Washington Nationals are finally in a position to capitalize on a carefully managed rebuilding process. Classifying the NBA draft prospects is no easy task; even those who spend hours in the gym evaluating every aspect of a kid only get it right a fraction of the time. As Fantasy basketball junkies, we want to sift through the fresh talent and decide who are the guys that can produce at the NBA level, who can develop into a stat sheet king, and who will never live up to their labeled potential. Yeah, it does take time for things to shake out, but you can still be smart about it. Despite the fact that the Saints are a win away from locking up home field throughout and a bye, they seem to be leaning towards playing out each game with starters. But, since they lost their undefeated status, they may start to limit reps if in Week 17 if they have nothing to play for. All Saints seem to be a safe play this week against the Tampa Bay Buccaneers. Now that we are roughly a quarter of the way through the regular season, we can start to assess how this class of rookies is performing. From a Fantasy perspective, this may not be as deep as those classes in years past, but there are still a couple studs and a few diamonds in the rough. These rankings are based on my projection of how they can help your Fantasy team for the rest of the 2009-2010 season. If you are in a keeper league, your strategy obviously changes and there may be a few guys to stash that you would not usually have on a one-year team.